Just when you thought you understood the cloud, the computing world has advanced once again, bringing us the edge. Edge computing differs from cloud computing in that it’s less centralized and brings computing resources closer to the location where they are needed. To understand this concept, it may help to recall how computing has evolved over time. With the first personal computers, processing happened in the machine that was sitting at your desk, and you used a monitor and keyboard to input data to and receive data from that processing center. Next came network computing, which put computing power on a server that satellite stations, consisting of the monitor and keyboard, connected to. When you used one of these stations, you were still operating equipment at your desk, but the actual computing was taking place at the server, which was typically located in the same building. Cloud computing moved the processing location out of the building to server farms that can be anywhere on the planet. When you use cloud applications, you’re still operating local equipment, such as your laptop, tablet, or smartphone, but the actual processing is happening far away (in the "clouds"). The next evolution, edge computing, has evolved because data processing in the cloud happens very quickly, but not quickly enough for some applications, due to the time it takes to send data back and forth between local devices and cloud servers. Edge computing consists of processing units located closer to those devices (at the "edge" of data sources) to process information more quickly. Edge computing is data processing that happens close to data sources. In just one of its many potential applications, edge computing works in conjunction with the Internet of Things (IoT), which consists of internet-enabled, or "smart" devices (everything from your car to your refrigerator). It allows these devices to send data (like how much milk you have remaining) to a physically close processing center, rather than a more distant cloud location. This method decreases the amount of data, and the distance it has to travel, allowing processing to happen faster, resulting in more efficient device operation. Edge computing will support the IoT more as technology evolves. Take the example of self-driving cars, which will continue to become more common in coming years. To operate properly using cloud computing, a car must send data about current conditions to a server that could be in another state, or even another country, and wait for a response about how to proceed. This process takes only seconds, but, in instances that require a faster response, such as a pedestrian entering the car’s path, a few seconds might be too long. A local data center can process the data and send a response much faster, enabling the car to brake in time to avoid the pedestrian. Increasingly common gadgets, such as smart thermostats and smart speakers, use edge computing technology to respond quickly to changing conditions and commands. Smart cities and homes, messaging, drones, and augmented reality can all benefit from faster, localized data processing as well. The same principle works for any enabled device, with the processing center either directly on the device, or at a nearby location. Potentially, a device could use both the cloud, for less time-sensitive processing, and the edge for more urgent requirements. Or, as with the security camera example below, it could use the edge to collect data to later be sent to the cloud, when processing demands are reduced. A business example is a retail store with a collection of enabled security cameras throughout. Using the cloud-based method, the cameras send data to a server, again potentially thousands of miles away, which identifies motion and saves those clips to the store’s account. Using edge computing, the processing unit can be part of the camera itself, sorting which clips need to be saved and which don’t, and sending only the relevant data to the server. This process reduces the load on the store’s computing capacity, enabling more efficient operation, and protecting the company’s other data from potential breaches. 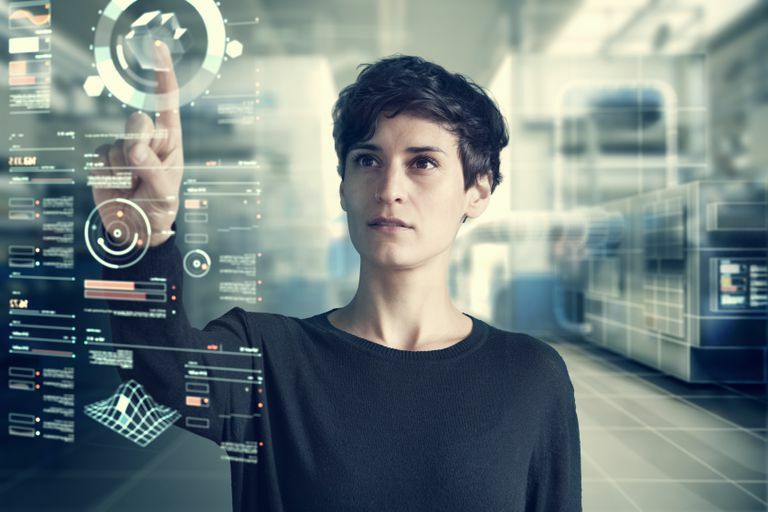 Edge computing can be used in a variety of industries beyond retail, including manufacturing, energy, utilities, transportation, defense, healthcare, and media, just to name a few. Imagine the benefit of smart sensors attached to utility equipment using fast edge processing to send an alert to maintenance crews immediately following a damaging storm. This new technology also has a role to play in emerging 5G wireless networks, which will be able to accommodate many times the number of connected devices using them at any given time. 5G networks will be able to transfer data hundreds of times faster than 4G, will incorporate several times the number of cell stations, and will significantly reduce latency (the amount of time it takes data to travel). Telecom providers using 5G will use local data centers on or near 5G towers, giving the network an extra boost. Edge computing offers many benefits, several of which we’ve already described: faster, more efficient data processing; safety; reduced drain on existing networks. Another is that edge computing decreases the potential problems associated with breaks in cloud service. But, edge computing also entails some drawbacks. Perhaps the most important one is that increasing the number of data processing locations also increases the potential for cyberattacks. Despite some instances in which edge computing can protect other data streams, standalone data processing equipment or devices that themselves perform processing functions can alternatively become a gateway for such attacks. Another drawback is that devices that include processing functions are more costly than previous versions, and additional equipment may be needed to operate them. Also, it may be possible to overwhelm edge computing networks if the right balance isn’t struck between what functions should be performed locally versus in the cloud. Experts view edge computing as the Next Big Thing in computing technology, one that will take many years to reach its full potential, and one that will transform the way we live on a scale comparable to the reach of the internet itself. A range of equipment falls under the edge computing umbrella, including 5G cell stations, data center infrastructure, and applications to analyze data more quickly. The number of sensors associated with smart cities, homes, and vehicles is projected to grow exponentially in coming years. Wireless 5G networks, supported by edge computing, will be able to manage the data produced by these devices in ways that 4G can’t. In recent years, IoT device manufacturers have been faulted for leaving security matters to chance. This issue will become more important as these devices are further integrated into the overall computing landscape. From the consumer perspective, most of the changes will take place behind the scenes. For example, you may be aware that you can use smart devices, that smart city technology makes your daily life easier or safer, or that your mobile carrier offers 5G; but you might never see the equipment that makes these services possible. Businesses, on the other hand, might be more aware as they address common problems or look for ways to beat their competition, and find answers with dedicated edge computing solutions. Companies like Amazon, Google, Microsoft, Dell, IBM, and Hewlett Packard Enterprise have already developed edge computing products. Meanwhile, the cloud isn’t going anywhere. It will still be part of the greater processing landscape. But now it will share some of the data load with the edge.